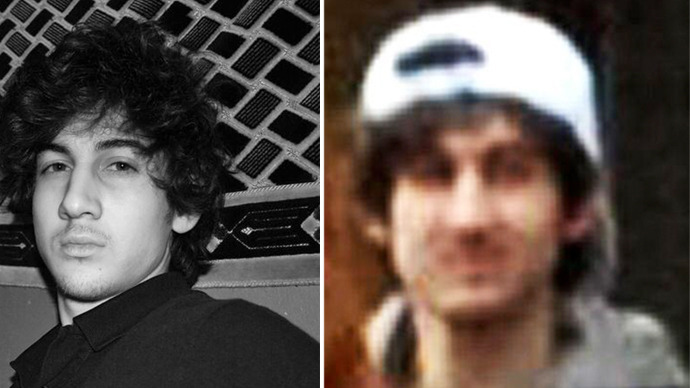 A photo of Dzhokhar Tsarnaev from his VKontakte page (left) and an FBI-released photo of the Boston bombing suspect (right). The suspects in Boston bombing were identified as Tamerlan Tsarnaev, 26, and his brother Dzhokhar, 19. The elder brother was killed in the stand-off with the police, while the younger has been arrested. The father of Dzhokhar Tsarnaev, Anzor Tsarnaev, says his son is “accomplished medical student” and “a true angel”, AP reports. He spoke to the news agency from the city of Makhachkala, capital of the Russian republic of Dagestan, shortly after police said his other son, 26-year-old Tamerlan, had been killed in a shootout. "My son is a true angel," the Anzor Tsarnaev told AP. "Dzhokhar is a second-year medical student in the US. He is such an intelligent boy. We expected him to come on holidays here." In the interview to reporters, Anzor Tsarnaev confessed he talked with his son about the bombing earlier this week. “We talked about the bombing. I was worried about them," he said. Anzor Tsarnaev called on his son to give up peacefully. At the same time he warned that if the US kills his son, "all hell will break loose." The brothers’ uncle has confirmed to AP that the brothers lived together near Boston and have lived in the United States since immigrating there about a decade ago. Dzhokhar Tsarnaev became an American Citizen on September 11, 2012, CBSBoston reported. “I say Dzhokhar, if you are alive turn yourself in and ask for forgiveness from the victims, from the injured,”another uncle of the suspects, Ruslan Tsarin, has called on his nephew, also suggesting he ask for forgiveness. “He put a shame on our family, he put a shame on the entire Chechen ethnicity,” he said speaking to reporters outside him home in Montgomery Village, Maryland. "I dearly ask you to respect our property. With the families of those who suffered, we're sharing with them their grief,” The Guardian cited Tsarin. “And ready to meet with them, just to bend in front of them to ask their forgiveness." There is a page at the Russian social network VKontakte (In Contact) with the name Dzhokhar Tsarnaev living in Boston and studying at Cambridge Rindge & Latin School. A friend of Dzhokhar Tsarnaev has confirmed to RT that they used to study together in UMass Dartmouth in 2011, but haven’t been in touch since last year. “I don’t want to talk about this, so I ask you not to bother me anymore,” he added. The name is also listed among the recipients of Cambridge scholarships in 2011. The Cambridge school mentions Dzhokhar Tsarnaev as its athlete of the month for February 2011, saying that he is an athlete. The VKontakte page studied by RT mentions a school in Makhachkala, the capital of the Republic of Dagestan, as a place Tsarnaev studied between 1999 and 2001. The Tsarnaev family moved to Dagestan from Kyrgyzstan in 2001, the school spokesman told RT. Dzhokhar studied there for just one year and produced no particular impression, good or bad, on the teachers. Dzhokhar was born in Kyrgyzstan. The family, which also included two daughters, Bella and Amina, had the status of refugees at the time they moved to Russia. Dzhokhar has several Chechen-related interests stated in his profile. He states that he speaks Russian, English and Chechen and holds career and money as his personal priorities. He claims he is a believer in Islam. The page has but a handful of posts, most of them jokes. The owner’s last visit of the page was from a mobile phone shortly before the shooting in Boston started. Some Russian-language comments on the page accuse Tsarnaev of being behind the bombing. They were posted after the news of a possible connection of a Dzhokhar Tsarnaev to the bombing broke. The first suspect in the Boston Marathon bombing, who was shot dead in a firefight with the police, is allegedly Tamerlan Tsarnaev, an older brother of the suspect at large. He is said to be from Chechnya, who fled to the US as a refugee. Tamerlan fled Chechnya with his family because of the conflict. However, despite spending the most of his life in America, he claimed not have “a single American friend.”“I don't understand them," reads one of the captions to the set pictures of Tamerlan, which RT managed to find online. In 2009 he was put under arrest for beating his girlfriend, who described him in one interview as a “very nice man,” according to the City of Cambridge Police Department. A passionate fan of boxing, he spent a lot of time training for competitions, according to Johannes Hirn, who posted a photo essay entitled ‘Will Box for Passport’ on his page on Photoshelter.com. “Unless his native Chechnya becomes independent, Tamerlan says he would rather compete for the United States than for Russia,” reads the caption to one of the pictures that shows Tamerlan during his workout. As a competitive boxer for a Team Lowell club, Tamerlan won the Rocky Marciano Trophy for as New England Golden Gloves heavyweight champion in 2010. According to the captions, besides boxing, Tamarlan studied at Bunker Hill Community College in Boston. As RT also found out while searching internet for details about Tamerlan, he had a profile on YouTube. He joined it in August of 2012, and five months ago created a playlist dedicated to terrorism. Named simply “Terrorists”, the playlist consisted of two videos, which are now no longer available. Although largely filled by ordinary music videos, Tamerlan Tsarnaev’s YouTube channel shows a growing predilection for radical Islamism. He repeatedly listened to songs such as ‘I will dedicate my life to Jihad’, as well as videos recorded by recent converts to Islam.